When tea comes in contact with a surface, such as your kitchen sink, it leaves a light tannin stain behind. Initially, you may not even notice the stain but with continual exposure, the tea stain builds up on your sink, leaving an unsightly, brown stain. Even when your kitchen sink is clean, the tea stain leaves it looking dirty. Costly commercial cleaners are unnecessary for removing tea stains from your sink's surface. Supplies found readily around the home help restore your sink to a clean-looking, stain-free appearance. As tea spills or splashes in your kitchen sink, stains begin to build up. Place 1/2 cup baking soda in a bowl. Squirt in enough dishwashing detergent to make a mixture that has the consistency of cake frosting. Stir well with a spoon. 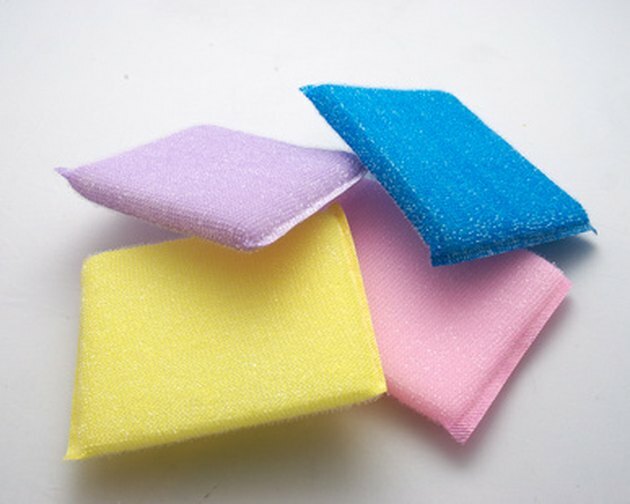 Gently remove stains with a nylon mesh sponge. Wet a nylon mesh sponge and dip it in the baking soda cleaning paste. Scrub the tea stains in your kitchen sink with the paste. Rinse off the sponge as you lift tea stains, then continue to scrub until you remove as much of the tea stains as you can. Rinse your sink of the baking soda paste and wash away any loosened tea stains. Wet a stain erasing sponge and use it to remove any remaining stubborn tea stains. Rinse the sponge as you remove stains. Dry out your sink with clean, dry cloths.